This edition of Better Policies for Development focuses on illicit financial flows and their detrimental effects on development and growth. Every year, huge sums of money are transferred out of developing countries illegally. The numbers are disputed, but illicit financial flows are often cited as outstripping official development aid and inward investment. These flows strip resources from developing countries that could be used to finance much-needed public services, such as health care and education.This report defines policy coherence for development as a global tool for creating enabling environments for development in a post-2015 context. It shows that coherent policies in OECD countries in areas such as tax evasion, anti-bribery and money laundering can contribute to reducing illicit financial flows from developing countries. 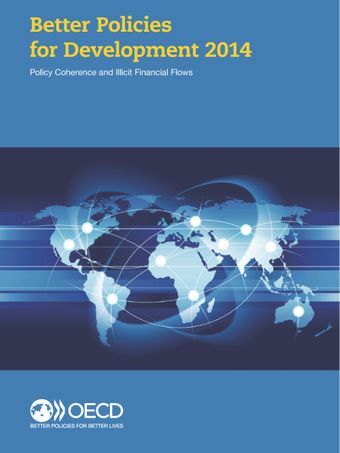 It also provides an update on OECD efforts to develop a monitoring matrix for policy coherence for development, based upon existing OECD indicators of ‘policy effort’. The report also includes contributions from member states. Most illustrate national processes to deal with policy coherence for development beyond 2015. Why focus on policy coherence for development in the post-2015 agenda? How are OECD countries promoting policy coherence for development?